When my belly needs a hug, I resort to comfort food. Those dishes my Mom made that made all the boo boos go away. One of those dishes is Lasagna. Whenever I eat this, it brings me back to Holiday Dinners at my Grandparents. So when a restaurant opens and the specialty of the house is Lasagna; I must check it out. What is that restaurant? Tommy Lasagna. 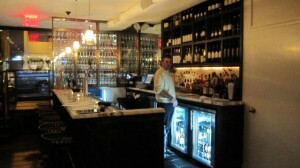 Tommy Lasagna is the new kid on the block in the heart of Gramercy. 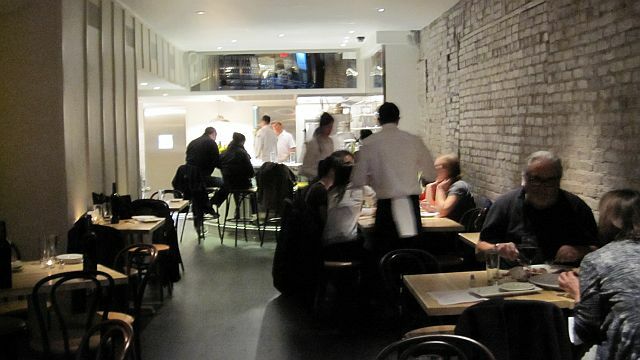 With it’s dark wood floors and tables, exposed brick walls and open kitchen, the vibe is relaxed and warm. I decided to check it out with a friend after our usual Sunday Movie Day. As soon as we walked through the glass doors, we were greeted by a friendly smile. We were kindly seated by the wall so we can view the cooks in the kitchen, as well as the patrons coming in. We each ordered a glass of wine, while glancing over the menu. I counted eight different kinds of Lasagna. Lobster, Truffle, Lamb and Veggie to name just a few. Even the entrees looked interesting, but Lasagna we came for and Lasagna it is. We decide to order two different kind and share. Our choices…Tommy Lasagna and Truffle…OH MY! 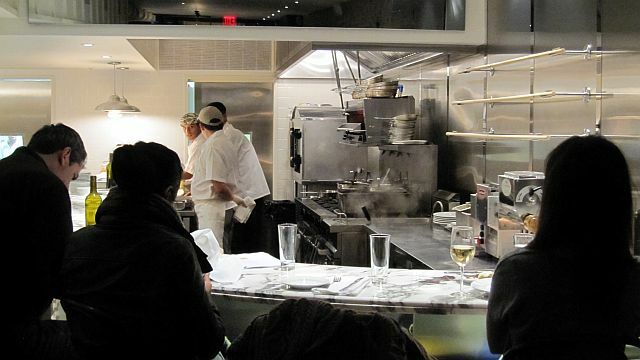 We watch the Chef in the kitchen prepare each dish and glance at the plates passing our table. “What’s that one?” “And that?” Note to self….Shrimp with herbed Spaetzle is a must try next time. 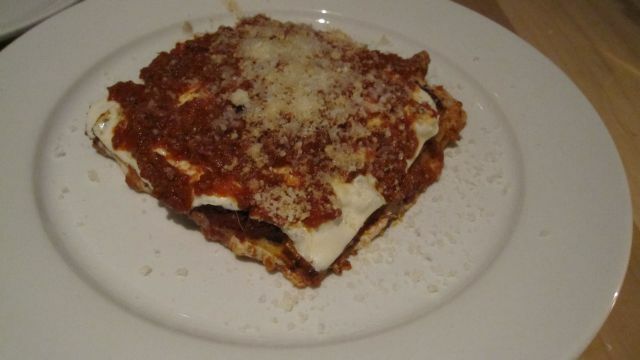 Before we know, two works of art are set down in front of us…..LASAGNA. 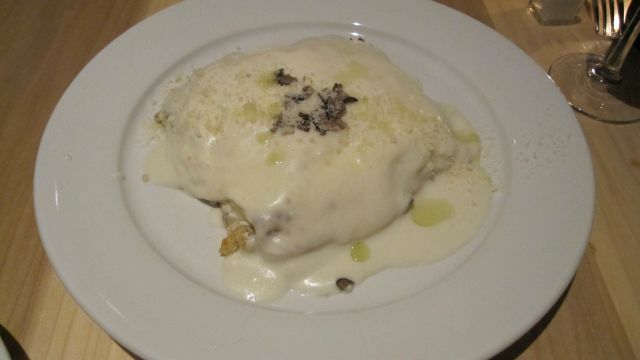 Picture it….Wild Mushrooms and Truffles layered between sheets of fresh pasta blanketed with a creamy and cheesy bechamel sauce with a final touch of parmesan cheese and truflle oil. One word….SINFUL!!!! The Tommy Lasagna is totally old school. Rich and hearty Bolognese sauce, ricotta, fresh basil and grated parmesan cheese. Now this is the kind that I grew up on, so I am a Lasagna Snob. One bite brought a tear to my eye. Is my Grandmother back there? The prices are on the top end of the Cheapeats scale – $18-$22, but it’s totally worth it. I have deemed this my new neighborhood spot and plan to grab a seat at the kitchen counter as often as possible. This entry was posted by Rosemarie on Monday, December 19th, 2011 at 6:38 pm	and is filed under Flatiron District, Gramercy, Italian, Manhattan. You can follow any responses to this entry through the RSS 2.0 feed. You can leave a response, or trackback from your own site.